with all the trades early last century. with over 1000 animal subjects and characters. 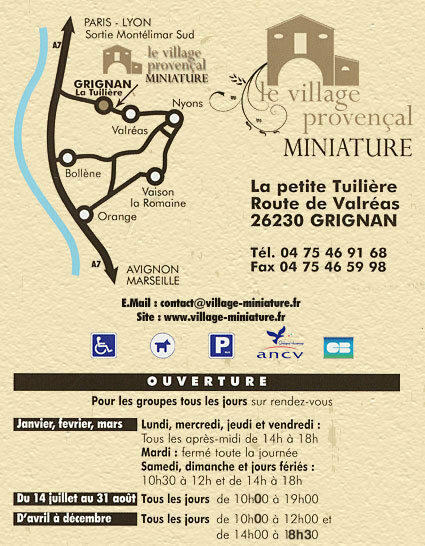 Average length of visit is 45 minutes. 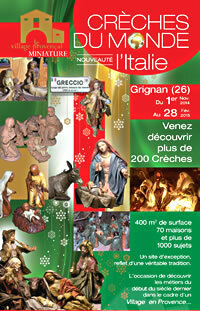 On site Shop welcomes you and presents its products and Provencal figurines. All the colours of Provence before you amazed eyes. Staging the Nativity scene dates back to the Middle Ages. At this time, plays were very popular but they were based on pagan traditions. As the main theme was the birth of Our Saviour, the church was against this kind of representation. These live nativity plays, using village people as the actors and real animals, became more and more common. Gradually the actors were replaced by figures made of wood, cardboard, wax, etc. The first crib scenes, like those we know today, first appeared in churches in the 15th century. As religious festivals were banned during the French Revolution, cribs retreated from public areas into people’s homes. Little by little, cribs became inspired by daily scenes and characters from local life were added. In Provence, these characters are called Santons from « SANTOUN » in Provençal, meaning Little Saint. 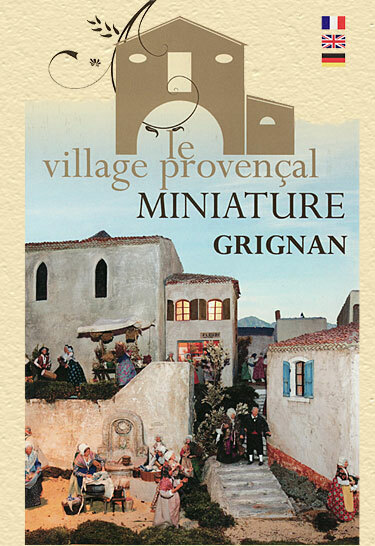 From the 19th century onwards, the Provençal crib scene became even more popular. All the trades of the period were shown in local costume. Among these characters who appear in pastoral stories, we can find Baby Jesus, the Virgin Mary, Saint Joseph, the Ox and the Donkey, the Angel, the Wise Men, the Shepherds, the Village Idiot, the Town Crier with his tambourin, the Fisherman, the Water Carrier, the Miller, the Baker, the Basket Maker, the Grinder, the Washerwoman, etc..
You will see all these trades and characters portrayed at the miniature Provençal village.